The people of White Earth in northwestern Minnesota are trying to bring back the lake sturgeon. The mammoth fish, a holdover from prehistoric times, was once plentiful in the lakes and tributaries of the Red River watershed. But unregulated commercial fishing in the late 1800s all but wiped out the population. Officials on the White Earth Indian Reservation say when the sturgeon disappeared, so did an important part of their culture. Tribal members are now working to restore the fish and reclaim their heritage. A lake sturgeon, caught on Lake of the Woods in northern Minnesota. Lake sturgeon typically reach three to five feet in length, and up to 80 pounds in weight. They can live to be 150 years old. WHITE EARTH FISHERIES MANAGER RANDY ZORTMAN squats beside a half-acre holding pond just up the hill from Icecracking Lake near the reservation's southwest border. What he sees below the surface are small, shark-like fish with long tails, scaleless skin and bullet-shaped heads. "We're looking at two-inch sturgeon, and hopefully, they're feeding. They look like they've grown since last week when we stocked them, so I assume they're growing. You see one feeding right there. He just picked something up out of that clay," he says. Zortman is well aware band members have high hopes that the 40,000 sturgeon fingerlings will thrive once they're dumped into two area lakes. It's been decades since anyone has seen a sturgeon in reservation waters. "The last one was taken in the 1930s out of White Earth Lake, the last documented sturgeon. They're prehistoric. They were here when the dinosaurs were here," Zortman says. The real damage was done a century ago, according to former Green Party vice presidential candidiate Winona LaDuke. 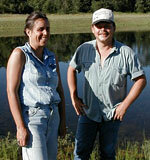 Her White Earth Land Recovery Project is involved in the effort to bring back the sturgeon. Lake sturgeon, which can reach well over 100 pounds, were prized for their meat and their eggs, which were eaten as caviar. And, LaDuke says, the fish produce a substance in their swim bladders once used as a clarifying agent for alcohol. "They actually used sturgeon, because they're so rich in oil, to fuel the boats on the river. They burned them. They would lay them down like planks, or logs, and throw them in and burn them, which is a grievous and immense waste of life," LaDuke says. Comparing the sturgeons' fate to that of the buffalo, LaDuke says its demise also meant the disappearance of age-old traditions of the White Earth Band, like annual harvest gatherings and celebratory feasts. "Sturgeon are part of our culture. We have clans that are related to sturgeon, and songs and a lot of our history," says LaDuke. "This isn't about the economics of game fish, or sports fishing. This is about a relative that is an essential part of our culture, and the process of recovering that relationship, recovering ourselves and recovering our ecosystem." White Earth band members Winona LaDuke and Randy Zortman are leading the effort to restore lake sturgeon to White Earth and Round lakes. LaDuke says the sturgeon is an important symbol in tribal culture. This will be White Earth's third attempt at reintroducing sturgeon to their waters. The first batch of eggs died in a Wisconsin hatchery. Last year, the sturgeon fry made it to White Earth, but then were wiped out by a bacterial infection. If all goes well, the band will release 13,000 sturgeon into Round and White Earth Lakes this fall. Fisheries manager Randy Zortman says the plan is to release about that many fish annually for the next five years, and then assess the project. But Zortman says it will be decades until its known if the fish have permenantly re-established. "It takes 25 years for them just to mature to reproduce. And then females only reproduce probably once every four years. It takes them that long to develop the eggs. That's how prehistoric they are. They're a different fish - they could live to be 150 years old," Zortman says. White Earth is just part of a multi-agency effort to reintroduce lake sturgeon to the Red River watershed. The Minnesota Department of Natural Resources is in the fourth year of a stocking project. And White Earth is working with the DNR and the U.S. Fish and Wildlife Service to alter or remove dams along the waterways, so the sturgeon can swim upstream to spawn.